Konark Dance and Music Festival, founded by the brilliant Odissi dancer, Late Guru Gangadhar Pradhan in the year 1986 is a global exposure of Indian dance and culture. The dance and music festival is organized in the famous sun temple, Konark Sun Temple, built back in the 13th century. It is an occasion of gathering all the contemporary artists together developing cultural brotherhood. The festival is a cultural meet of various dance forms – artists perform different contemporary dance forms from the regional Odissi, Bharatnatyam, Kathak, Manipuri, Kuchipudi. Mohiniattam and myriad of classical, tribal or folk dances of India on the artificial stage, Natyashala created in the temple. 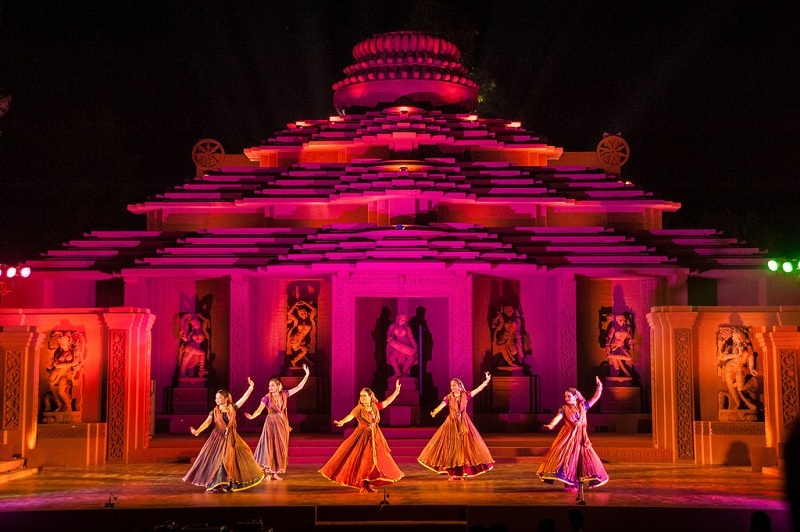 This blog is an insight to the world-famous Konark Dance and Music Festival 2019. If you are someone inclined towards art and culture, we’re pretty sure you won’t like to miss it. This year is the 33rd edition of Konark Dance and Music Festival. An attractive stage Natyashala, will be created in the historical Sun Temple in Konark. The aesthetic and spiritual vibe turns the ambience and stage magnificent. The dates of Konark Dance Festival are fixed for every year. The cultural fest starts on 19th February and continues for 5 days till 23rd February. If you are too late reading this, book cheap last minute flights to be a part of the festival. You still got some time, hurry! The significant objective of celebrating the Konark Dance and Music Festival every year is sharing the aspect of contemporary dance style with the people. The motive is to reach out to a larger mass each year spreading the awareness of Indian dance, music, art and culture. The Konark Festival committee is on a look out for diverse range of articts who can bring up the fusing charm of classical contemporary dance style on the stage. Any distinct folk style is also appreciated at the cultural festival. The international dance festival has garnered love and popularity by showcasing various contemporary, folk and classical dance styles, but it is not just about dance. There are various other events organized during the 5 days of festival that includes Crafts Mela, an exhibition of souvenirs and sculptures created by expert craftsmen. You will also enjoy an array of lip-smacking food. It is a joyful experience of art, culture and food. How to apply for the Konark Dance Festival 2019? Like every year, the festival team is on a quest of exceptional classical-contemporary (fusion) dance style or a unique folk style – a performance of around 15mins to 1 hour. The performance must be so choreographed that it can be performed both in non-conventional and conventional spaces. One can also take part in the workshops and conferences held to promote exchanges among artists. On the first day of the festival, the selected artists will perform a short piece of dance together lead by a professional from the industry. The festival is also open to submissions from various other art forms such as theatre performance, visual arts, music, installation, sculpture, films and photography. However, it must have a connection with dance and movement. To apply, one should send his/her latest profile, two latest high quality photographs, a group or solo performance recorded in a DVD to the head office address. The name of the dance style should be mentioned on the DVD cover. For more information on application and non-performing art submissions, visit their official website – http://konarkfestival.com/ . If you are in the state’s capital for some work, you are too lucky to be a part of this cultural gathering of professional artists. You will not regret booking business class flights as the festive feel will compensate it all. Konark is well-connected through road, rail and air. Tourists can easily reach the beautiful destination by a suitable means of transport. By Air: If one wants to reach Konark by air, the closest airport is Biju Pattnaik International Airport of Bhubaneswar. The airport is located at a distance of 62 kilometers from where one can rent a cab or taxi to cover the remaining distance by road. By Rail: To travel by train, the nearest railway station is Puri Junction, located at a distance of 36 kilometers from Konark. After getting down at Puri Railway Station, one can hire a taxi or car to Konark. By Road: Traveling through road is a great experience in itself. There are Odisha State Public Transport services to Konark from major cities of the state. One can also book seats in Volvo buses running from Puri, Bhubaneswar, Cuttack and Gorakhnath. No matter if you are a professional artist, you can still be a part of the festival audience and have a splendid experience at the Konark festival and the special attractions in and around the small town. For proper schedule of Konark Dance Festival 2019, check out their official website – http://konarkfestival.com/.